Duplication nodes in Treetable with a self referencing table. When you make a treetable over employees table, typical relation Employees-Manager for HR schema. You see duplicate nodes as see in next image. 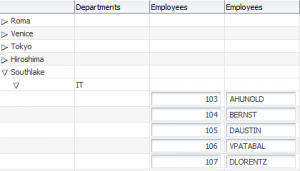 In this post explain how to put input text field inside adf tree table. In the same tree we will have a readonly fields and editable fields.